The Queensland Museum Network has hundreds of dedicated volunteers working across its four campuses. And with so many it’s difficult to single out an individual, when the work of so many helps keep the Museum operating. But two volunteers that stand out would have to be Jan and Rosemary. The pair may not be doing ground-breaking research or delicate conservation work, but when it comes to loyalty and dedication – you can’t go past them. During National Volunteers Week, the Museum took time to honour the pair who have each been volunteering with the Queensland Museum & Sciencentre for 20 years. Jan and Rosemary both started out as volunteers at the old Sciencentre in George Street and migrated with it into its new home at the Queensland Museum South Bank. The change meant that they were now Queensland Museum volunteers and along with this name came a range of new exciting experiences. Every Thursday morning without fail (except for the odd holiday break) for the past 10 years, the pair meet up with their fellow co-workers for a cuppa and chat about world issues before heading out onto the Museum floor. Loyalty like Jan and Rosemary’s is hard to come by, what’s even more amazing is that the work they do is for no financial reward. “You can’t do it for gain of any sort because there’s nothing to be gained other than personal satisfaction, pride in what you do and getting involved in what you’re doing,” explained Rosemary. Both women agreed that volunteering is about finding a sense of community and that they have found this within the Museum environment. Their role at the Museum gives them the opportunity to learn new things and keep up-to-date with events and activities happening around South Bank. Plus the behind the scenes tours at the Museum are always a bonus! Apart from their volunteer positions every Thursday, their weeks are filled with social commitments and hobbies. Jan enjoys keeping fit, visiting the art gallery and going to shows at the cultural centre, and Rosemary is busy with two other volunteering jobs at her local Golf Course and at Meals on Wheels. Volunteering is all about trying something new and meeting a bunch of great people along the way. The Queensland Museum wouldn’t be the same without all of its fantastic volunteers and so we would like to say THANK YOU to every volunteer that supports and helps out at the museum. 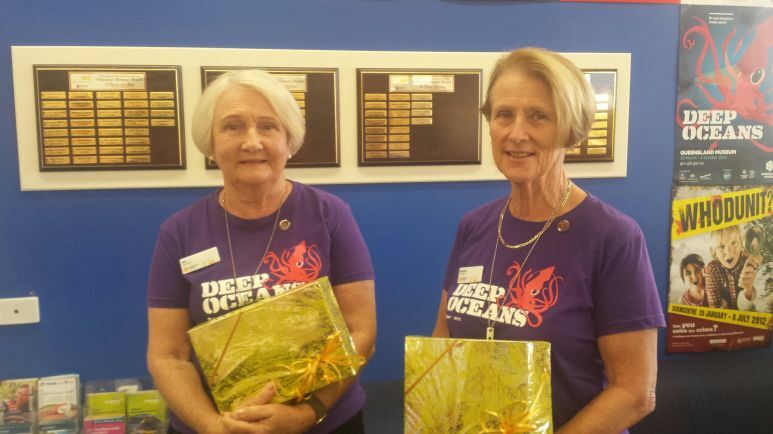 Queensland Museum & Sciencentre volunteers for 20 years Jan (left) and Rosemary (right).